Near Future would be 2016 and thankfully the designers are not dating it like 2050 or 2200 for this concept! Anyways we are talking about the Persian Delight: Nokia CLIPit Concept Mobile Phone. Brushed steel and Persian turquoise stone encrusted, this phone proposes a bevy of features like finger print as your SIM, Touch pad-Dot matrix screen, hands free clip on design, and a combo of Philips Lumalive and conceptual “Smart fabrics” to blend out a 12”screen! Finger print as your SIM. CLIPit has all the cell phone’s data web based and you can reach not only by CLIPit but from multiple devices like other cell phones, disposable cell phones, your car kit, your home phone and so on. The key is your finger print. On top of the CLIPit you have a steel touch screen made by a group of small Light Emitting Diodes installed in the steel touch pad. So you have dynamic buttons and can dial, send and receive SMS and navigate your music easily. 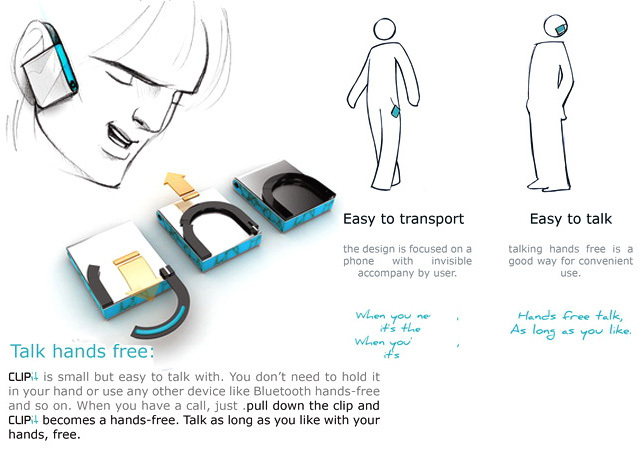 You don’t need to hold the phone in your hand or use any other device like Bluetooth hands free. When you have a call, just pull down the clip and CLIPit becomes a hands free. The ear phones of CLIPit have two sockets. You can hang your CLIPit around your neck with them when listening to the music. Like a beautiful necklace made by turquoise and steel. The way to connect with other devices for CLIPit is to Clip it to them. You can clip it to so many things to have connection with them. For example back panel of public bus seats. 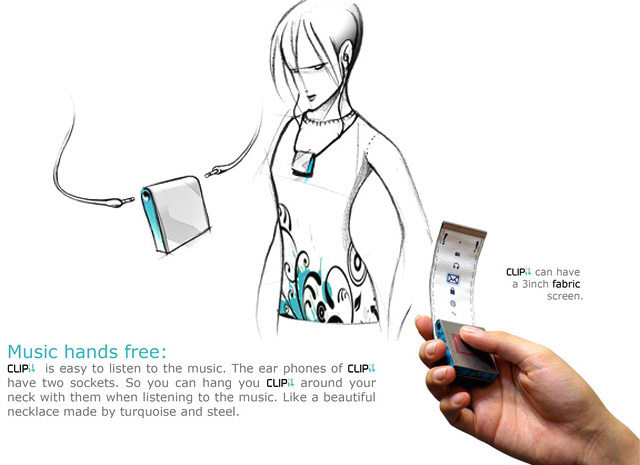 You can clip the phone to any part of your clothes or your bag. You can hang it around your neck with its earphones. You can wear it like a Bluetooth hands free. And also it is enough small to put it in your pocket. PHILIPS has developed a new technology called “Lumalive”. They have fabricated some kind of cloth that has internal OLEDs and is quite a color fabric screen. The design team used a developed form of that technology in the CLIPit and has two fabric screens. The 3- inch screen is just a formable, flexible cloth that has a “Lumalive” screen as the upper layer. You can clip your CLIPit to this 3-inch screen and have a mobile phone with a 3-inch color screen. It is quite BIG for a mobile phone. But the 12-inch screen is a combination of “Lumalive” and a concept fabric called “Smart fabrics”. “Smart fabrics” are cloths with a net of sensors between its layers for touch sense. The net is cut able and the fabric can be cut or sewed. In fact smart fabrics are touching sensitive cloths. This fabric is combined with “Lumalive” and to become a multi-touch color screen. Clip your CLIPit to it and you have a folding pocket 12-inch laptop. The 12inch touch screen is also a medium for CLIPits to share their data with each other. Quite easy. Quite funny.